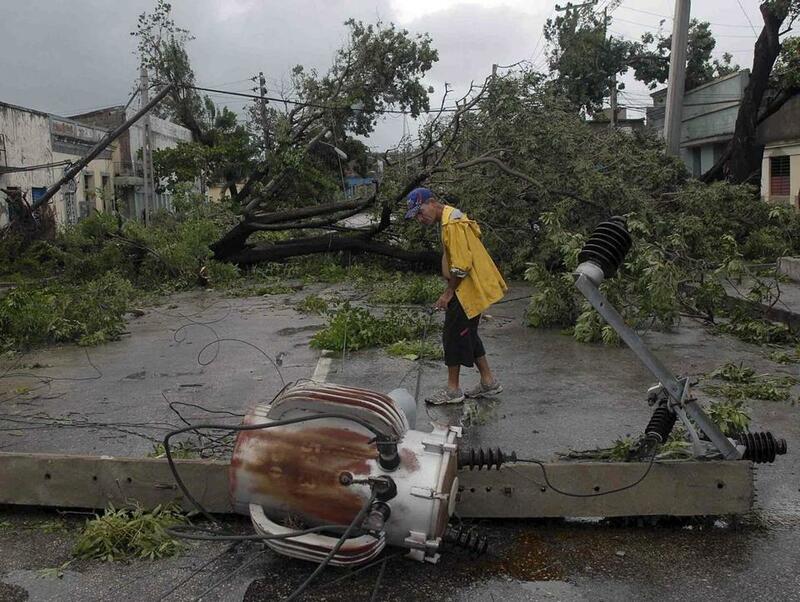 Hurricane Sandy roared through Cuba after taking four lives in Haiti and Jamaica on Thursday. SCITUATE — On his last boat ride of the season Thursday, George Dow was enjoying clear blue skies, warm temperatures, and calm seas. The same sublime weather beckoned Judy Wainwright outdoors to bask in the sun’s rays in her oceanfront backyard. 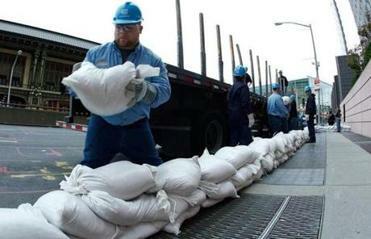 But Hurricane Sandy was on their minds, as it was on the minds of many Massachusetts residents. The Category 2 hurricane killed one man in Jamaica and three people in Haiti before barreling through eastern Cuba and into the Bahamas Thursday. By Sunday evening, the mild weather New England has been enjoying may be replaced by Sandy’s fury, which has the potential to become a “historic” storm here, according to the National Weather Service. The storm is expected to at least graze or possibly directly hit New England by early next week, according to the service. So Dow, of Marshfield, was pulling his 24-foot sailboat out of the harbor to safety. Wainwright, whose modern two-story home on Turner Road is protected by a massive seawall, said she and her husband had not yet decided whether to ride out the storm there. “If it looks like we’re going to get slammed, we will make a reservation down at the local Harborside Inn here in Scituate,’’ said Richard Wainwright, 77, sitting on the thick concrete seawall. In anticipation of the impending storm, the Department of Public Works is shoring up that seawall, breached in a December 2010 storm. Officials say the wall should be secure by Friday. The storm’s path is not certain, and it may well veer away, but nonetheless, officials in towns such as Plymouth, Hull, Marshfield, and Newburyport are assessing their level of preparedness. In Plymouth, volunteers are being contacted to find out whether they are available to serve at shelters at Plymouth South High School and Plymouth Middle School, if needed. On the North Shore, the Department of Public Works was checking storm drains on Plum Island to be sure they are clear and removing metal ramps leading out to the beaches, which were put down to prevent erosion from foot traffic. Newburyport and Newbury are working together and will meet with the US Coast Guard in the coming days to evaluate emergency evacuation plans if needed, said Thomas Howard, Newburyport’s city marshal and Emergency Management Service director. Marshfield police Lieutenant Paul Tabor, director of the Emergency Management Agency, feared the potential impact on the town. Peter Judge, spokesman for the Massachusetts Emergency Management Agency, has been in constant contact with the National Weather Service for updates on the storm’s path. The agency has contacted cities and towns throughout the commonwealth, directing them to assess preparedness, to go over checklists, and make sure generators and backup fuel are ready. 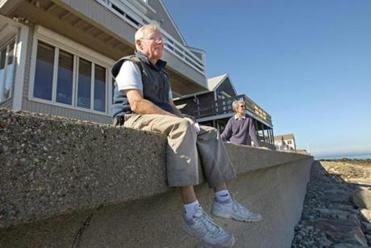 Richard and Judy Wainwright sat on the seawall by their Scituate oceanfront home awaiting Hurricane Sandy. Governor Deval Patrick said state utilities are slated to report to him by Friday about their plans for storm damage repairs and customer service response. On Thursday, Senator Scott Brown wrote to NStar and Unitil executives, asking the utility services to outline their plans in preparation for potential power outages in Massachusetts next week from Hurricane Sandy. National Grid spokeswoman Charlotte McCormack said the utility company has been monitoring the storm and has ramped up its command system and contacted contractors. “They’ll be here before the weekend so they’ll be in place before the storm gets here if that’s the path it takes,” she said. 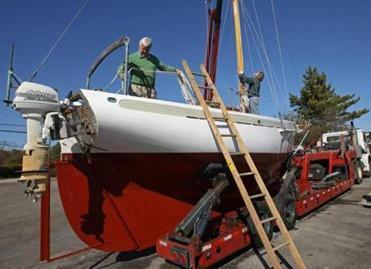 As officials made emergency preparations, George Dow took his sailboat out of Scituate Harbor. NStar spokeswoman Caroline Pretyman said the company is on high alert. National Weather Service meteorologist Charlie Foley said the storm has the potential to be historic. 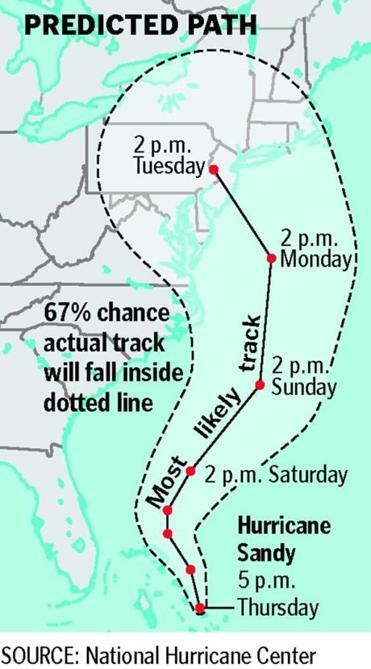 Models show that it could make landfall on the East Coast anywhere from New Jersey to Maine late Monday into Tuesday, he said. A marine weather statement from the Weather Service called Sandy “a dangerous and potentially life-threatening storm for mariners” with offshore seas as high as 25 feet. “This is something that people want to take seriously,” Foley said. Martin Finucane of the Globe staff and Globe correspondent Melissa M. Werthmann contributed to this report. Brian Ballou can be reached at bballou@globe.com.